A company you can trust for reliable products. 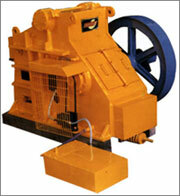 Single toggle type with rugged construction, to with - stand vibration and heavy shock loads. For more production, higher efficiency and greater economy. Fabricated from best quality steel plates specially designed and fabricated with extra rigs to take heavy shocks loads. Draw Back Mechanism Steel Draw Back rod with adjustable compression spring. One Flywheel is grooved for Vee Rope drive. Another is plain for flat belt. Both wheels are with counter weights. Expertise plus experience. Skilled work force and quality conscious management all go to make the firm a reputed source for stone crusher.